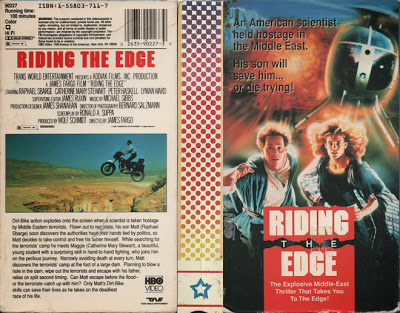 Riding The Edge is an absurd, but entertaining and fun movie. John Harmon is a scientist and he has invented a solar power satellite. But then he's kidnapped by middle-eastern terrorists, and the only person who can save him is his son Matt (Sbarge). Matt is a dirt-bike champion who uses his skills to defeat the terrorists while also figuring out who are the spies in the government. The only problem with the movie is that the second half is too slow. Besides that, The movie is fun. The performances are average. There's one Afghan boy named Lawrence. That's just not very believable. As you can see this was released on the great Paragon label and has a classically 80's plotline. In the end: The movie is silly, but it keeps your interest.